Comparison between Before and After Financial Crisis, Vol.19, No.2, p.55-82. Abstract: The purpose of this paper is to study the time-varying conditional correlation across 12 MENA stock markets over the period July 2005 to January 2013, while taking into account the impact of two downturn periods. Methodologically, we use a multivariate framework which allows for both return asymmetry and leptokurtic distribution. The empirical results demonstrate that both the Israeli-Hezbollah war of 2006 and the financial crisis of 2008 generate substantial similarities in return linkage patterns among MENA stock markets. Most importantly, the results imply that there are still potential benefits for portfolio diversification, even in downturn periods when they are the most needed. Also, we find that conditional correlation depends on levels of stock market liquidity and financial development. Abstract: This paper provides an econometric assessment of the deterrence model, with a specific focus on violent crime in England and Wales. It finds that beliefs about the probability of arrest are substantially lower than official arrests rates, but when adjusting for non-reporting by victims, the perceived risk of arrest and actual arrest rate are very similar. Further, no empirical evidence is found to the effect that perception of the probability of arrest differ between criminals and non-criminals. Perceptions about general perceived risk of arrest are not found to be related to an individual's own criminal and arrest history. Instead, an individual's beliefs about the perceived probability of arrest are largely affected by neighbourhood conditions and victimisation. The link between perceptions and criminal behaviour is also examined, but the empirical evidence is not in line with the basic predictions of the economic theory of crime. by Xiao (2009), we find that the long-run coefficients between nominal interest rates and inflation can be affected by the shocks and, therefore, may vary over time. More specifically, in the upper quantiles there is one-to-one relationship between the two variables, supporting the Fisher effect, while in the lower quantiles, the nominal interest rate responds by a lower percentage than the change in inflation. This is known as the Fisher effect puzzle. Thus the Engle-Granger cointegration regression may suffer from model misspecification, because of the assumption of a constant cointegrating vector. A possible explanation for such an asymmetric relationship between the two variables is provided. Abstract: In this study we measure multiple dimensions of product market competition and examine their impacts on corporate governance disclosure, based on a sample of UK public firms over the period 2001 to 2009. We use factor analysis to explore the different dimensions of product market competition; and regression models to analyse the association between multiple dimensions of product market competition and corporate governance disclosure. We find that firms in less competitive industries have significantly more corporate governance disclosure. Furthermore, we detect a positive association between corporate governance disclosure and board independence, as well as audit committee independence. This suggests that firms with better corporate governance tend to disclose more information to external investors. Overall the findings support the view that managers use more corporate governance disclosure as a substitute for the external disciplinary force of product market competition. Abstract: This paper analyses the implications of macroeconomic policy interactions for financial stability, proxied by financial assets prices (equity and bonds). The empirical analysis applies a Vector Autoregressive (VAR) model and our findings suggest that an accommodating monetary, and disciplined fiscal, stance has been optimal for both stock and bond markets. There is also ample evidence of interdependence between policies, as an expansionary fiscal policy could persuade the monetary authorities to adopt an accommodating stance, whereas a contractionary monetary policy leads fiscal policy towards consolidation. The interrelation between monetary and fiscal policy necessitates coordination between them for the sake of financial stability. Abstract: This paper presents a chronological, adaptive and reflective investigation into students' perceptions of and motivations for choosing to study economics. Applications of multiple quantitative and qualitative techniques to student-level primary survey and focus group data reveal the following. First, students' perceptions of economics are on average somewhat negative, although there is considerable variation. Second, they regard economics as having value, in terms of providing insight, specialist knowledge, and skills of argumentation (all of which are perceived to be superior to peers). Third, they recognise the subject yields financial and other career advantages and has kudos. Fourth, they suggest that the relevance and usefulness of economics is important and consequently that excessive theorisation and a lack of practicality are problematic. These findings have considerable implications for how economics is taught, and for the nature of the subject itself. Abstract: One of the unofficial goals of the formation of the European Monetary Union (EMU) was to enable member nations to keep inflation at a low and stable rate, while minimising the costs associated with trying to reduce the rate of inflation. This paper seeks to examine whether the formation of EMU has enabled the euro area countries to reduce the output losses that are associated with disinflations, which are captured by the sacrifice ratio. We find that the formation of EMU has not reduced the output costs of disinflation. Moreover, we find that the movement towards EMU following the Delors Report in 1989 coincides with greater output losses for eurozone countries that were undergoing disinflation. This suggests that EMU has not made it less costly for euro area countries to reduce their rates of inflation, and any achievement of price stability has only occurred at high cost. Abstract: This paper examines British Government policy with regard to the taxation of betting, from a historical and economic perspective. The taxation of betting is traced to the introduction in 1926 of a tax on betting turnover by the Chancellor of the Exchequer, Winston Churchill. By 1930 the tax had been scrapped. 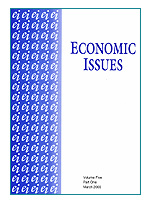 This paper seeks to examine what lessons can be learned from this attempt at the introduction of a new tax and from subsequent Government policy with respect to betting taxation, and asks what policy implications can be drawn by other countries experimenting with the introduction of taxes on the turnover or gross profits of their betting operators. Abstract: This paper draws on the literature that explains why governments spend procyclically, to predict the pattern of cyclical expenditure across government budgets. Procyclical expenditure increases at a faster rate than income in economic upturns and falls at a faster rate in recessions. The more politicians indulge pressures to increase expenditure in an economic upturn, the more they find it difficult to sustain expenditure in a recession. In this paper, differences in politicians' willingness to increase expenditure in an economic upturn are relevant when predicting patterns of cyclical expenditure across budgets. Predictions are tested with reference to expenditures from government budgets in 23 OECD countries (over the period 1995-2006). Central government capital expenditure and sub-central government expenditure are systematically more procyclical than expenditures from other budgets. Abstract: The financial crisis of 2008 provides an interesting opportunity to investigate the effect of the crisis on the capital structure decisions of firms. Over the years, capital structure choice has attracted considerable attention in the literature and is important to firms, investors and policy makers. We find that during the 2008 financial crisis, the coefficients of tangibility and market to book (MTB) ratio exert a stronger influence on capital structure choices than prior to 2008. We also find that the coefficient of profitability exerts less influence on capital structure choice than before the crisis. In addition, the sign of the coefficient of firm size is negative, which is exactly the opposite of the situation that existed before the crisis. Further analysis indicates that during the 2008 financial crisis, pecking order theory has more explanatory power than trade-off and market timing theory.